Today, TFW’s market cap is £156m and the price is 135p — a 500% return if you include dividends collected along the way. 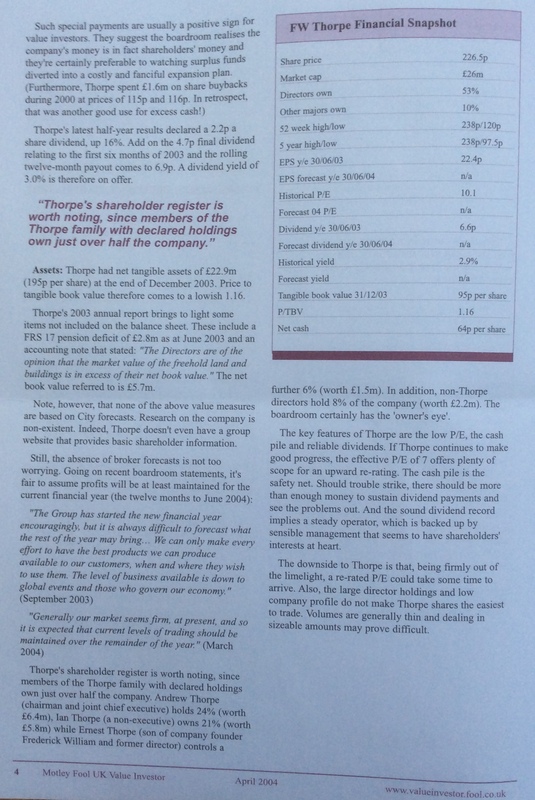 Read my write-up from 2004 below (apologies for the poor-quality images) and you’ll discover family management running an ordinary business that was blessed with plenty of spare cash and liked to pay a rising dividend with the occasional special payout. Fast forward 11 years and you will see in my write-up today that there is still family management running an ordinary business… that’s still blessed with plenty of spare cash… and still likes to pay a rising dividend with the occasional special payout! It just goes to show that successful companies do not always have to boast fantastic patents, powerful brands or some other form of Buffett-type ‘moat’. Instead, companies run by dedicated executives with a proven, long-term mindset — and have a sizeable financial commitment riding on the share price — can also make the difference. Unfortunately I ignored my own investment advice in 2004 — in fact, I delayed buying TFW shares until October 2010 at 68p. My last purchase then occurred during March 2012 at 90p to give me an average buy price of 79p. FW Thorpe (TFW) was established during 1936 when Frederick Thorpe and his son Ernest began manufacturing something called vitreous enamelled steel reflectors. A few years later they started producing circular reflectors for gas-filled lamps. Almost 80 years later, the Thorpe family continues to run the business, which today designs and sells a comprehensive range of commercial lighting equipment. TFW’s main subsidiary is called Thorlux and its products illuminate factories, offices, schools, hospitals and even police cells. A Thorlux spin-off called TRT focuses on lighting for road tunnels, and has achieved notable success with installations at Blackwall, Heathrow and around the M25. TFW’s smaller divisions produce emergency signs, sign lighting for shops and even Victorian streetlamps. TFW’s website has all the details. Products are sold on build quality and reliability — important for emergency signs and tunnel lighting — as well as running-cost efficiency. More than half of TFW’s lights are now of the LED variety and many systems can automatically illuminate at different levels depending on the amount of natural light available. Sadly my financial archives do not stretch all the way back to TFW’s flotation in 1965. But I do know there has been some respectable progress since 1996, with sales having advanced from £21m to £63m to take profits from £2m to almost £12m. The dividend, meanwhile, has in the same time marched from 0.42p to 3.25p per share without any setback — and four special payments have been declared on the way, too. All the more impressive, Thorpe’s track record shows no banking-crash trouble and minimal acquisition activity. As I say, the shares have been wonderful performers for long-term investors. Although the price back in 2004 was 23p, the best time to buy was actually early 2003 at 10p. The shares are now 135p. Sales at the main Thorlux division did tread water at £44m during 2011, 2012 and 2013, but have since moved to £50m. Meanwhile, the aggregate top line at TFW’s other divisions stagnated at £10m but now runs at £13m. Some 13% of sales in 2014 were made outside the UK and I am pleased TFW has resolved to “put more sales people abroad” to capture extra business. I also welcomed the 1.5p special dividend. Ever since that 2004 write-up, I’ve been a big fan of TFW’s family boardroom. You see, the management offers stability, experience and a significant financial commitment to the business, which in my opinion often signal a dependable investment for long-haul investors. A grandson of founder Fred Thorpe is in charge today. Andrew Thorpe was appointed joint chief executive in 2000 and chairman in 2003, but has served on the board since at least 1997. He boasts a 24%/£37m shareholding and — a particularly good sign for me — his dividend income last year was well ahead of his basic salary and bonus. I should add that Mr Thorpe’s remuneration does not seem extravagant given the company’s level of profits. Two other descendants of Fred Thorpe control a further 27% of the group, meaning the Thorpe family as a whole enjoys a collective stake of at least £77m. 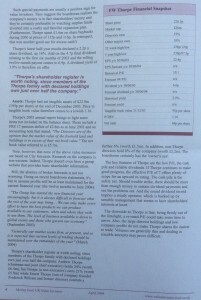 I’m impressed the Thorpes have barely sold a share during the last ten years. Among the non-Thorpe directors, Mike Allcock became joint chief exec in 2010 after starting out as an apprentice at TFW in 1984. Mr Allcock has led Thorlux since 2003, generally seems to be a safe pair of hands and — still in his 40s — looks to be the successor to the 60-something Andrew Thorpe. There are three other non-Thorpe executives, plus two non-Thorpe non-execs. The latter are both former long-time managers and have a combined £12m riding on the share price. True, corporate governance watchdogs will not like the structure of TFW’s board — especially given there is no separate audit committee and the remuneration committee is staffed by relations or former colleagues of the executives. But as far as I can see, the board has served all shareholders quite well over time and I take the view that if it isn’t broke, don’t fix it. There’s cash of £32m, freeholds of £7m, an equity portfolio of £3m, investment property of £2m, a loan to a former subsidiary of £1m… and various intangibles of £7m that include ‘fishing rights’ (don’t ask) of £182,000! There are no borrowings, too, although there is a defined-benefit pension scheme that is presently showing a funding surplus. Past accounts reveal TFW has pumped an extra £9m into its pension scheme since 2005 to shore up what was a persistent deficit. I’d like to think the current surplus means there won’t be a need for many further ‘special’ contributions. I’m encouraged TFW’s ‘operational’ assets have consistently produced high levels of profits for investors. During 2014 for example, average net assets (excluding cash and investments) of almost £40m generated after-tax profits of £10m — a return of 25%. The same calculation has topped 20% for the previous ten years. TFW’s operating margins suggest the firm enjoys a decent competitive position. Profits from group sales were an attractive 18% in 2014 and have in the past topped 20%. Indeed, margins at the main Thorlux division have topped 20% since at least 2009. During the last five years, cash capital expenditure has exceeded the total deprecation and amortisation charge by £6m. Meanwhile an extra £8m has been used for working-capital purposes. The total, £14m, is significant when aggregate operating profits during those five years was £56m. You could argue 25% of reported profits were not converted into free cash. That said, sales have advanced by £16m in the same time, while a few million has been spent on freehold property. So the profit not converted into free cash has been put to good use. Plus, the group’s net cash and investment position has continued to grow substantially. The 2014 annual results showed operating profits of £12m and, taxed at a standard 20%, would produce earnings of £9m or 8p per share. Subtract the group’s net cash, equities, investment property and that loan to the former subsidiary from the current £156m market cap (at 135p), and I get an enterprise value of £115m or 100p per share. Then divide that 100p by my 8p earnings estimate and I arrive at a P/E of 12.5. That multiple does look about right to me given Thorpe’s steady progress and the fact a decent chunk of earnings has not converted into free cash of late. The trailing dividend is 3.25p per share and supports a 2.4% income. A valuation bonus could come in the form of TFW’s freeholds. They are in the books at £7m, but the annual report small-print does reveal their market value to be “significantly greater”. Some of the properties were bought 20 years ago. Er, what have I missed that could hurt this investment? When a business has been going since 1936, employs veteran bosses and has plenty of cash on hand, it’s difficult to think of something obvious that could go disastrously wrong. I suppose one risk could be Andrew Thorpe relinquishing his executive duties and a non-family member taking charge. My money is on the aforementioned Mr Allcock being promoted, but you never quite know with quoted companies. The successful family culture of this firm could easily deteriorate with an outsider in charge. Another danger could be further technical advances within LED lighting. Radical products could be designed by rivals and leave TFW standing. Sadly I have no insight into TFW’s development edge — if indeed it has one. Nonetheless, TFW must have some technical ability to produce 50% of its 2014 sales from LED products. Furthermore, many customers still want TFW’s traditional lights, which must say something about the firm’s product quality. So I didn’t buy at 23p back in 2004, but my subsequent purchases have so far worked out quite satisfactorily. I just wished I had bought a lot more. You see, I have come to realise family-run firms such as TFW — rich in leadership, history and cash — can be genuine class-acts, and do seem more likely to earn respectable gains than many higher-profile ‘growth’ shares. Indeed, my TFW shares are all held in my SIPP and I can imagine myself still holding them when I can access that money in 2026! Sadly I doubt Andrew Thorpe will still be in charge in 2026. And if he’s not, well, I’ll just have to see what board changes are made. I can only trust the canny Thorpes won’t place their combined £77m shareholding at great risk. TFW currently represents about 6% of my portfolio and, while I am not a buyer at 135p, I think I would add more if the P/E multiple fell back into single digits. What a brilliant write up. As a former CS and now Pro member I’m so pleased that I was advised of this blog (Charvil I think it was!). I’ve thoroughly enjoyed catching up with your write ups and particularly this one, as it was one of the earlier recs I bought – and still hold. I still have several others too but I love the dependability of this company. Today you can finally have your “party hats out and corks popping” so thanks, good luck and blog on!